I SPENT ALMOST SIX MONTHS in Nepal last year and achieved a lifelong dream of going to Everest Base Camp and sleeping in a tent on the Khumbu Glacier. 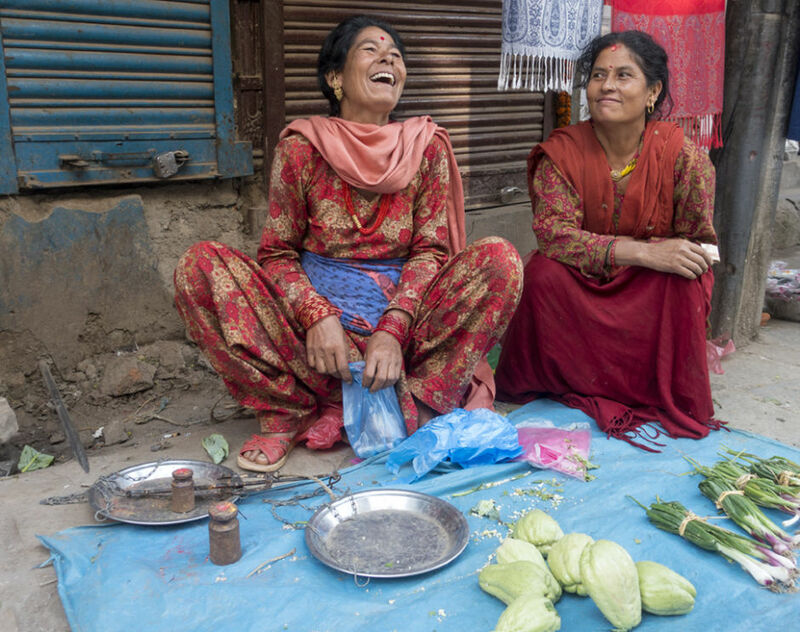 Kathmandu has its own special charm and is equal parts chaotic, dusty, and loud. If at first, I felt overwhelmed, I soon came to embrace the cultural differences. As a solo traveler, I was able to better immerse myself in the culture and everyday life of Kathmandu, getting to know people and becoming friends. With so many great discussions on politics, religion, and everyday life, I noticed a trend both in the city and in rural areas: women working in every field imaginable. Women are such an integral part of the society in Nepal, particularly because so many men leave to find work elsewhere. I loved walking around with my camera in hand, chatting (often with gestures only), and snapping pictures of the various women I met. Here are just some of them. Fruit and vegetable sellers are numerous throughout the city and can be found wherever there is some free space along the road. 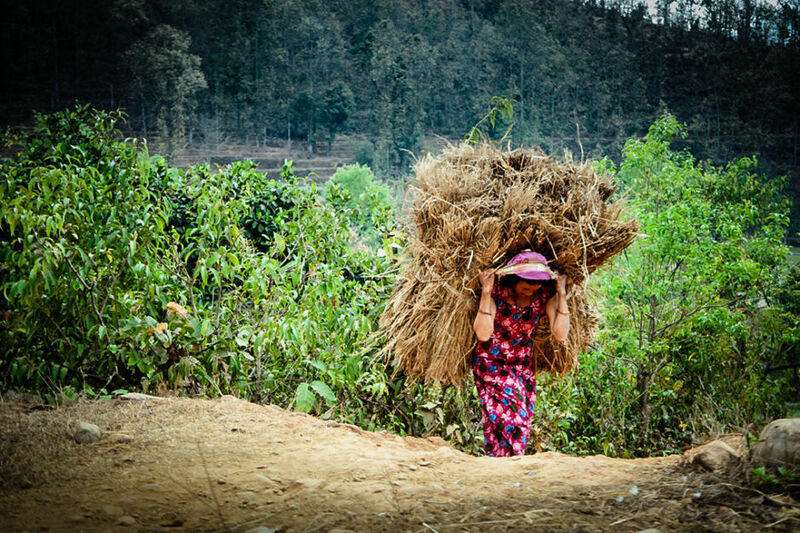 A Nepalese women in rural Nepal carries a heavy bale of hay on her back. Women in Nepal are frequently taking over all of the farming chores as more men go to find work in the cities and outside of the country. Construction is a major source of work in Kathmandu, especially reconstruction after the devastating 2015 earthquake. Female workers are as common as men. Lacking the machinery common in the western world, most work is done by hand from laying bricks, transporting rocks, and climbing scaffolding made of bamboo. The Boudhanath Stupa (or Bodnath Stupa) is the largest stupa in Nepal and the holiest Tibetan Buddhist temple outside Tibet. 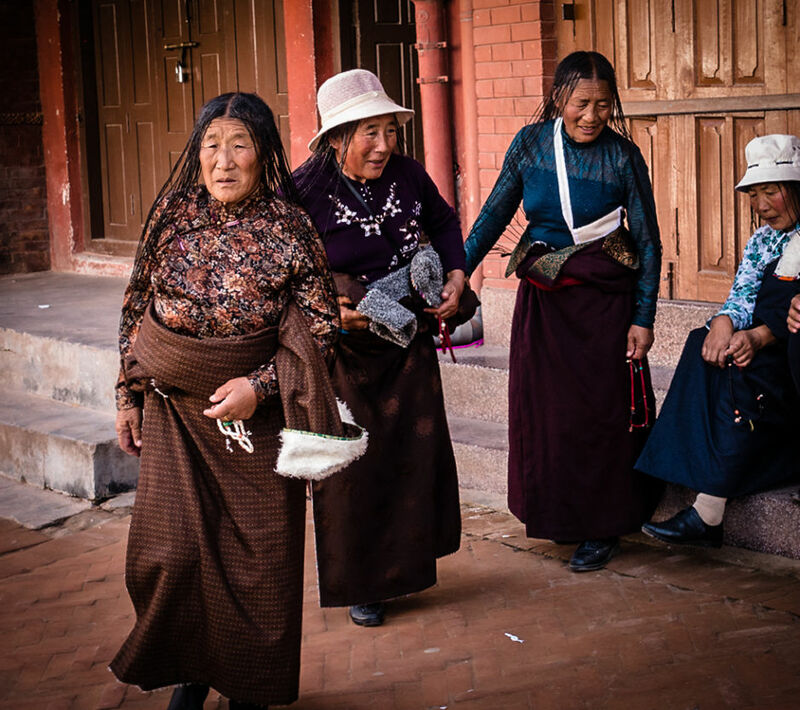 After the arrival of thousands of Tibetans following the 1959 Chinese invasion, the temple has become one of the most important centres of Tibetan Buddhism. Today it remains an important place of pilgrimage and meditation for Tibetan Buddhists. 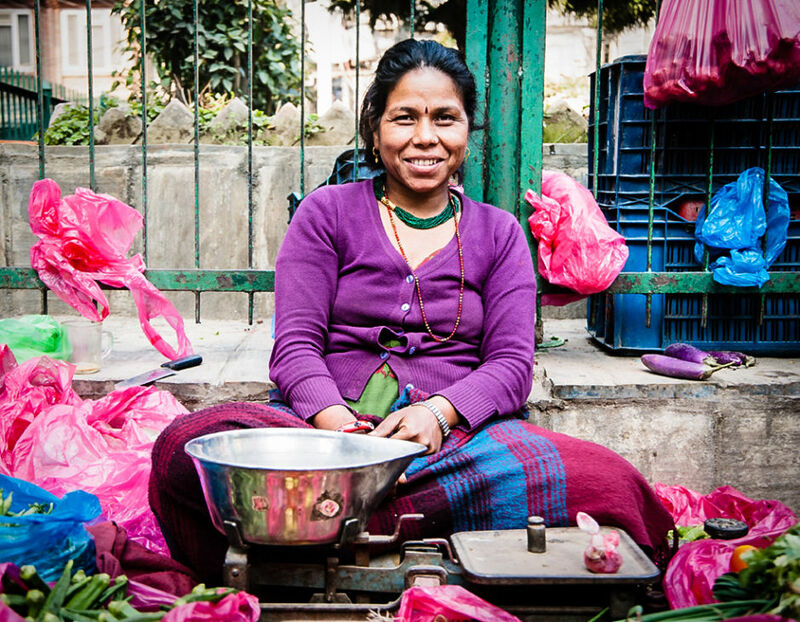 A Nepalese woman in Kathmandu is surrounded by colourful plastic bags as she sells fruit and vegetables on the streets. Street vendors are common in the cities and set up shop anywhere they can find a free spot on the sidewalk or side of the road. Everything from fruits and vegetables to clothing and trinkets are available. 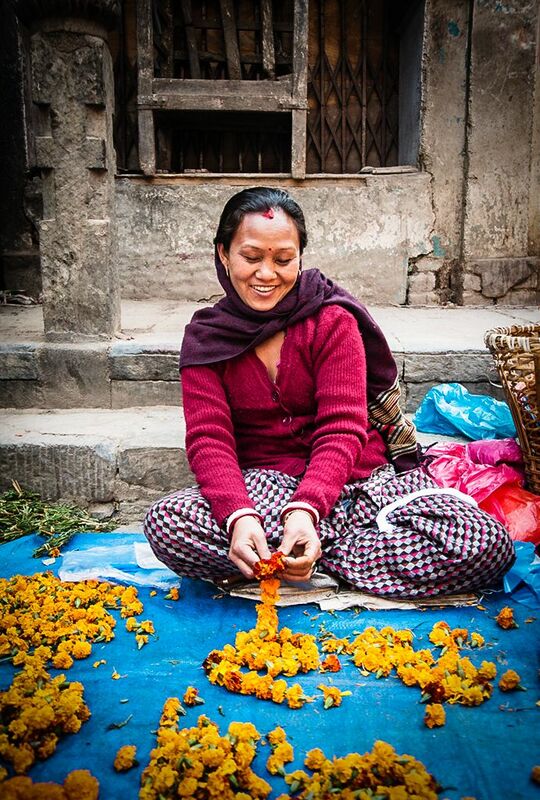 Sayapatri, or marigolds, are sold everywhere in Nepal. Garlands of marigolds are believed to bring good luck and happiness. The flowers are used during puja (prayer ceremonies) as offerings, and as decoration at weddings and other festivals, especially Tihar, the festival of light and flowers. 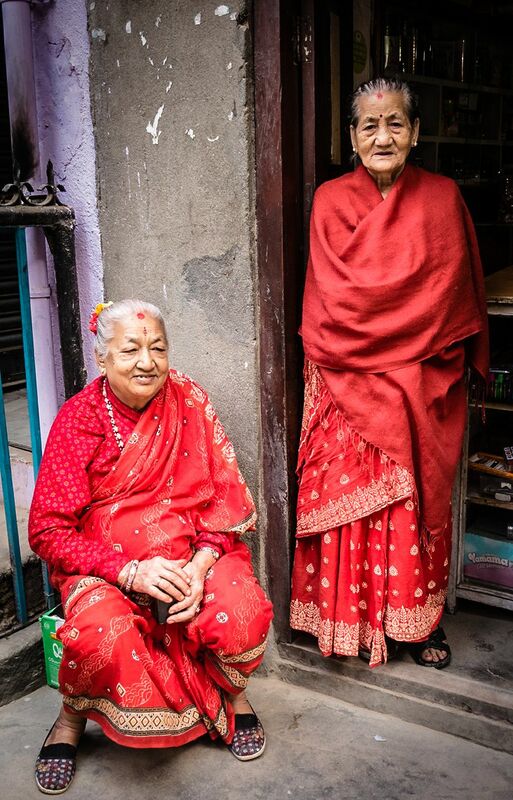 Two women stand outside their shop in Kathmandu. Their shop sells everything from food items to dusters. 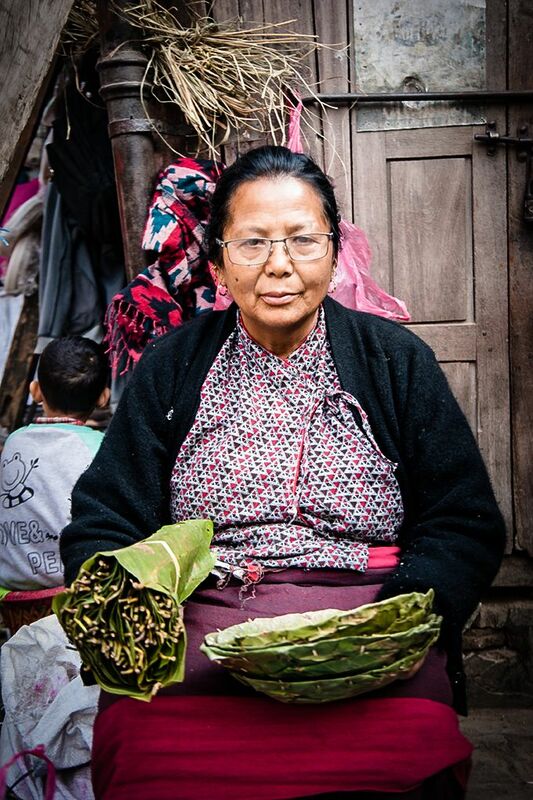 A woman makes and sells disposable leaf plates on the streets of Kathmandu. The plates are made from saal leaves and are used in many rituals in Nepal. They are made by stitching together the leaves with small bamboo sticks. 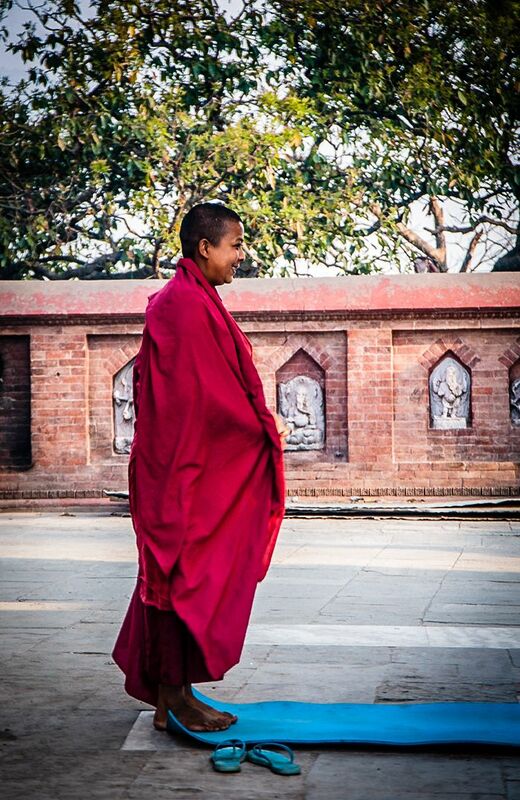 A female Buddhist monk or nun in Kathmandu has laid out a pad on the ground to protect her from the cement while she does her prostrations. Prostrations are used in Buddhist practice to show reverence. 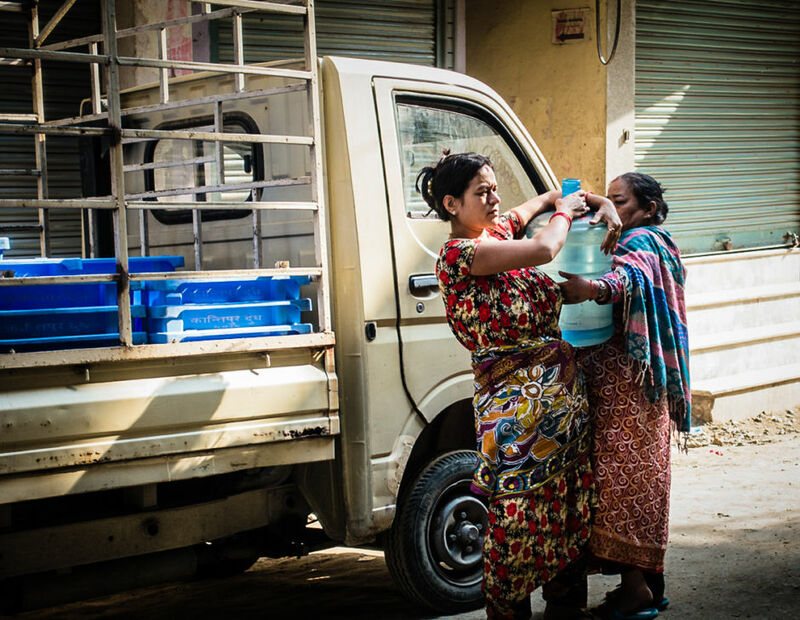 One out of five households in Kathmandu has no access to a domestic water source. None of the rivers that flow through Kathmandu are clean, the wells are drying up and there is insufficient infrastructure in place so many people have to buy their water from private sources.